Author Lucinda Bakken White began her professional career with an MBA and a coveted position at IBM. Throughout the years Lucinda’s deep connection with nature and her insatiable quest for learning has led her to study and work with internationally acclaimed philosophers and prominent figures across a broad spectrum of disciplines. With wisdom gathered from a lifetime of personal discovery and continual transformation, Lucinda is an Inner Wildness Guide helping others transform, and the author of her memoir Confessions of a Bone Woman: Realizing Authentic Wildness in a Civilized World. Confessions of a Bone Woman: Realizing Authentic Wildness in a Civilized World is a work of new age non-fiction by author Lucinda Bakken White. Born and raised in the 1960s, this self-confessed wild child struggles to maintain her identity as life and modernity attempt to shape her into something else. Despite exterior success that some only dream of, she is unfulfilled inside, and the connection to the bones of animals is the breaking point where the dam of her true self breaks free again. Told in the style of a poetic biography, this is the story of a woman returning to nature and the wild to heal herself despite the trappings of the modern world around her. This is one of those books you might not think you would enjoy from the outset, but I’d strongly encourage anyone to give it a try. Lucinda Bakken White writes with refreshing clarity about the various phases of her past, including her time in Silicon Valley where she had the lifestyle that many of us dream of, only to discover its true emptiness and move beyond it to other things. The ‘authentic wildness’ of which she speaks is realized through her exploration of nature and the behavior of animals as she seeks a balance between the so-called civilized world and the natural one from which we all originate. 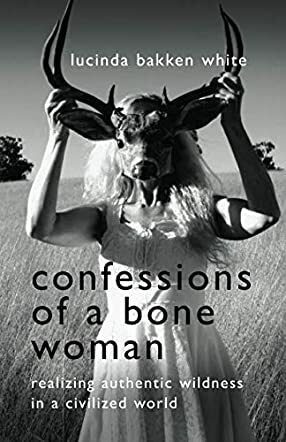 Overall, Confessions of a Bone Woman is an uplifting and eye-opening take on the falseness of modern life, with an intriguing revelation about what really matters at the end of the day.